I know by January I will be sick and tired of this, but I feel like a kid seeing snow for the first time. It’s been 27 years, so please indulge me for now. It’s great packing snow and is accumulating fast. By morning it’ll be several inches, and we can make a snowman! 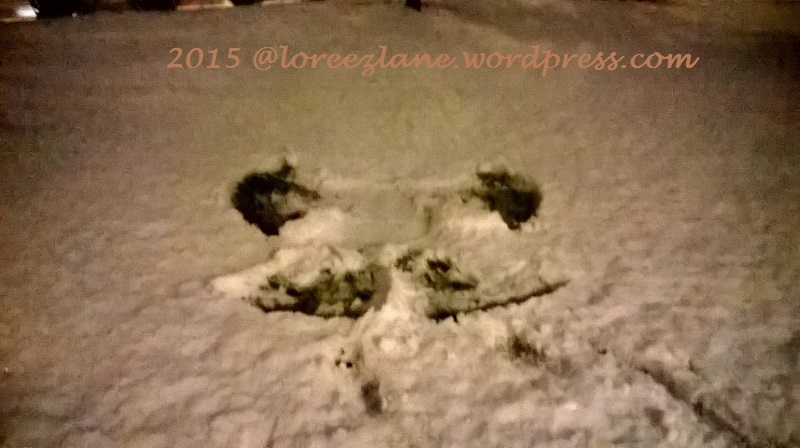 I already made my first snow angel. Max is seeing snow for the very first time in his life. I couldn’t get a good picture from my phone because he was moving so much. This is the best I could do below. He’s checking out my snow angel. He loves it. He was chasing after our snowballs. Did I mention it was good packing snow? Everyone have a blessed weekend. 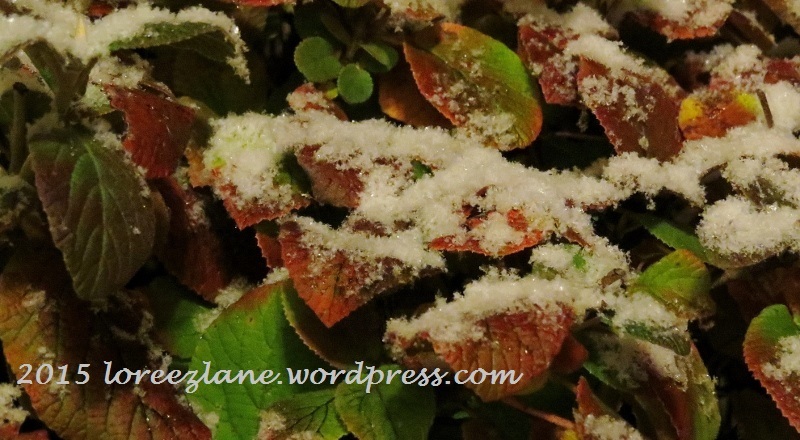 I wonder if we’ll get snow–Fozzie, being from California, should be quite curious about it! Even though it’s not our first time, watching things through their eyes makes it feel like it’s our first time, too. They are humanity’s gifts from God. It’s all upside down to me (Sydney – Australia) great pics! Yes we had the hottest November here for 33 years the Sydney Temp gauage reached 106 F (41 cel) on 20/11/2015. So really did enjoy those pictures taken. Whew! That is HOT! I’m so glad I don’t live in that heat anymore (recently moved from Florida). My pics probably seemed nice and cooool to you. Stay cool. I won’t say ditto … stay warm. As much as I’ve been grateful for the lack of snow and cold in Minnesota, when the first flakes fell last week, I had to admit that it felt wondrous. 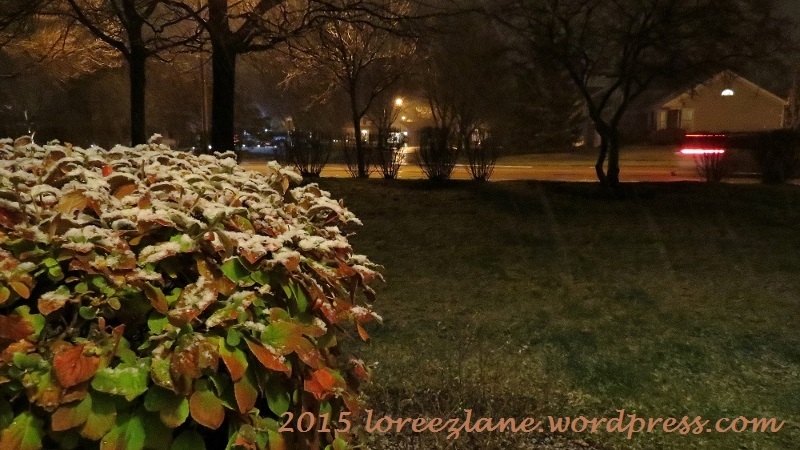 I don’t care how old I get, there’s something magical about the first snowfall of the season. Don’t get me wrong, I’ll be sick of winter by January. I’m glad that you and Max are enjoying the winter! Bet you’re not missing that Florida humidity, are you? Hi Terri. We ended up getting a foot of snow for the first of the season! Wow. I was worried Max wouldn’t like the snow, but he keeps wanting to go out and run in it. And, Nope. I’m not missing Florida at all, at least not until January. Hope your family is doing better. Stay warm. So excited for you, I know you were looking forward to it! Sounds like Max is enjoying the snow too. Thanks, Joy. We got a foot of the stuff. A lot for the first one, but still a great experience. The contrast of autumnal leaves and newly fallen snow is like frosting on nature’s cake. Lovely shot Lori. Did Max try to eat the snow? Hi Talia! Yep, Max tried to eat the snow. He liked trying to catch the snowballs we threw, too. Love that “frosting on nature’s cake.” Thanks so much, Talia. It’s pretty cool. Enjoy it! Thanks, Kourtney. It’s great to see it again after so long. NO! Please, keep that stuff up your way, Laurie. Unless it’s a Saturday and I don’t have to commute to work. It happened overnight Friday into Saturday, so we’re able to stay cocooned. We got way more than I imagined (a foot) for the first snow in 3 decades (for me), but that’s okay. Stay warm, Jill. No, ice is definitely not the same as snow. I’m surprised, I didn’t know that snow was rare by you. Hope you get to see the white stuff this year. Already! 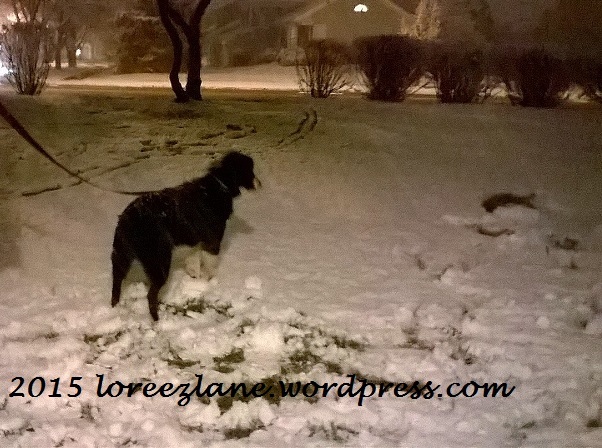 In the past I had 2 Rottweilers who adored snow, so I can imagine Max’s joy. I know, already? There’s about 8 inches this morning and it’s still coming down in sheets. Max and I already played in it this morning, but I hope this isn’t a precursor for the whole season. Thanks for having fun with us, EllaDee. Better you than me. 😉 Glad you’re enjoying it! I imagine after all that time in Florida, it would indeed be a treat. You don’t normally get as much snow there as here, so no worries. I just hope this isn’t a precursor for the rest of the season. At least I can enjoy this first one.